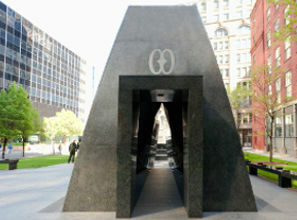 The African Burial Ground National Monument at Duane Street and African Burial Ground Way (Elk Street) preserves a site containing the remains of more than 400 free and enslaved Africans who were buried during the late 17th and 18th centuries. Lost to history due to landfill and redevelopment, the grounds were rediscovered in 1991 as a consequence of the planned construction of a Federal office building. The site's excavation and study is considered to be the most important historic urban archaeological project in the United States.A memorial was dedicated in 2007 to commemorate the role of Africans and African Americans in colonial and federal New York City, and in US history. A visitor center was later opened to educate visitors on the site and African American history in New York. Convenient parking is available near the African Burial Ground National Monument. Click on a location name to find parking information.